It's not often we get to see or hear about Pixar's film projects that don't make it to the big screen. newt is a rare exception, as there was plenty of pre-production artwork released before the film was finally shelved. But otherwise, I think there's a number of projects that get started and cancelled or put on hold that we never hear about. At one time, Toy Story 2 was going to be released as a 60 minute, direct-to-video sequel. But in November of 1997, during a showing of the story reels to Disney executives, they were so pleased with the results they requested Pixar to expand the story and make it into a 90 minute theatrical release. Toy Story 2 went on to be a huge success, bringing in over $485 million worldwide and was the 3rd highest grossing film domestically in 1999 with almost $246 million. Many people consider the film to be the best of the Toy Story trilogy. Wouldn't it be cool to know what the direct-to-video version would have focused on? I've read a few things on the web regarding the original plan and script. It seems the idea of Woody being kidnapped was a core premise from the beginning, but otherwise I haven't found a lot of other information. I was recently re-reading Pixar's 1996 and 1997 annual reports (what, doesn't everyone read their annual reports?!) and came across some great nuggets of information and pre-production artwork for the film. In Steve Jobs' letter to the shareholders in the 1996 report, he explained that work on the direct-to-video movie began in the summer of 1996 and would be released in the fall of 1998. Besides being excited to revisit the Toy Story characters, he gave no information on the premise for the film, but there were some storyboards, shown above. 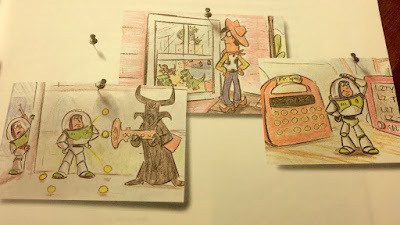 As you can see, some of the artwork (Buzz with Mr. Spell, Buzz in the what looks to be the elevator shaft) lived to make it into the final film. 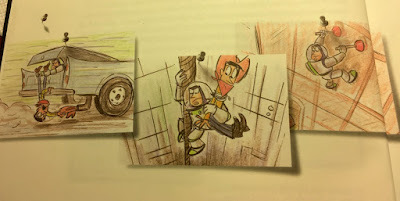 But you have to wonder about some of the other boards - Buzz holding Woody out of the back of the car, and what looks to be Buzz "kidnapping" Woody. And don't you love the design of what I assume is the original Zurg (with both Buzz's) - pretty creepy if you ask me! 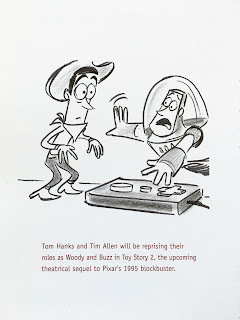 By the time the 1997 annual report came out (in early 1998), it had been announced Toy Story 2 would be released as a theatrical film and had been pushed back to the 1999 holiday season to give the team time to expand the story. As Steve Jobs wrote in his letter that year, Toy Story veterans Ash Brannon and Colin Brady would be directing with John Lasseter serving as executive producer. Again, Jobs was tight-lipped about the plot of the film, but there was one piece of artwork. Looking at the expressions of both Buzz and Woody just makes me chuckle! I'm not sure how the direct-to-video version would've differed from the final film, but I'm happy they saw its potential and upgraded it to a full theatrical release. It ranks as one of my favorite Pixar films!